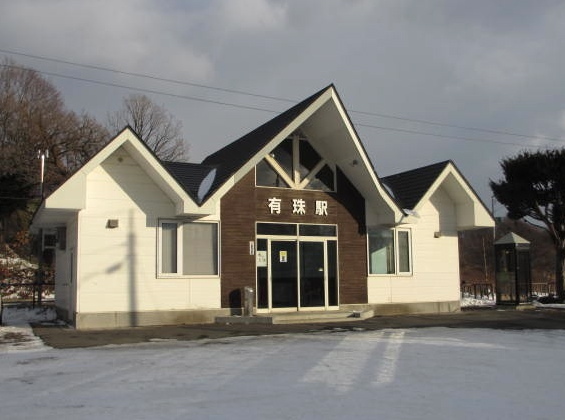 Usu , Date city, in Hokkaido, is nice and full of nature. We want to create a center for relaxation in Usu cho. “Usu Vacation Village” with our friends. 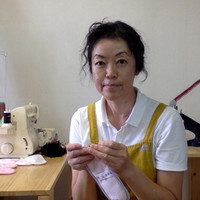 My name is Hiroko Hataya. I'm a native of Date city, Hokkaido. I have operated my foot massage school in Sapporo. where people can relax and heal. but in Usu the weather is nice with plenty of warm sunlight in March. Mt. 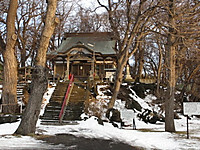 Usu is one of Japan’s most well-known volcanoes with an elevation of 737 meters (2,418 feet). 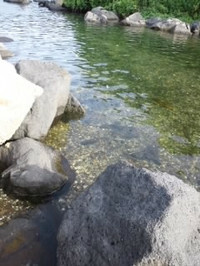 It is located south of Lake Toya and is surrounded by a rich natural environment. 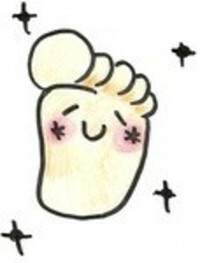 is to sell our foot healing products. and studio little by little in the future. The desks for the sewing machine is also handmade. which is waterproof and safe for the body. and may suffer from urinary incontinence. The sole reflects the condition of your health. you may also have other health problems more often. other parts of your body exprerience distress as well. When your heart is fatigued, your feet will get cold. the arches of your feet will swell. your toes become hard and dry. and dry you are more easily prone to become irritable or angry. The problem is that no one cares that your feet are tired. The key to your health is your feet. It's time to realize that the health of your feet is very important. It's also good exercise during the winter season. The recycled center stick from a plastic wrap package can be used as a massage tool that can be used while either sitting or standing. You can learn how to get rid of tired legs. During the last year we spent a lot of time and money researching how to create our products from scratch. Our efforts were successful and we finally created our health support products. However, because all of our products are handmade we can only produce a limited amount. We require your donation so that we can increase our production to accept large volume orders. Our fundraising goal is 4,000,000 yen total. So far we have raised 3,200,000 yen. We are only 800,000 yen short of our fundraising goal. With these monies we will be able to buy materials, develop product packaging, and purchase advertising. Please support our first step toward building Usu Vacation Village and for the future of Usu. When your heart is fatigued, your feet will get cold. If your stomach and bowels are sluggish, the arches of your feet will swell. When your back feels tired, your toes become hard and dry. As a consequence, when your feet get hard and dry you are more easily prone to become irritable or angry. The problem is that no one cares that your feet are tired. What will Usu Vacation Village be like? We would like to provide tours for people to visit historic landmarks and beautiful sites in Usu. We will produce and sell custom health foot bands and foot support products. We will also offer foot massage lessons. In addition, we plan to restore historic landmarks such as John Batchelor Memorial Church in the future. We will also train new foot massage therapists to volunteer their services in disaster areas. who were evacuated due to the eruption. A lot of people were tired and mentally exhausted at that time. When your feet get well then your whole body gets well too. When your feet are soft, and your heart is soft, your mind becomes more flexible. Your mind will be young and your face will look younger too. 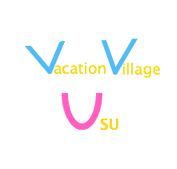 We are looking forward to your support for Usu Vacation Village! You will get a Usu postcard if you make a donation of 3,000 yen. You will get a foot band if you make a donation of 10,000 yen. 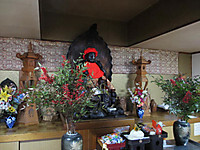 and continuing to Enmei Jizouson in Uso Cho, Date city, Hokkaido, which is both relaxing and healing. We would like to take you step by step down this walking trail starting from Usu station. We begin the trail at Usu station. 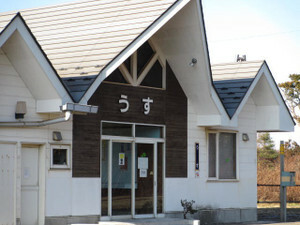 between Date station and Toya station. If you walk at a leisurely pace it will take you about ten minutes to go from Usu station to John Batchelor Memorial Church. 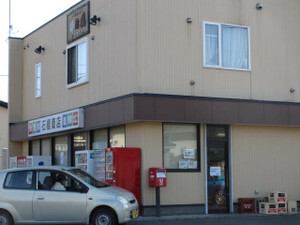 The first point you will encounter along the way will be the Ishibashi store. This is the only store in Usu cho. 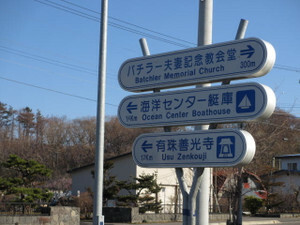 Make a left at the Ishibashi store, and as you continue walking you will soon see the John Batchelor Memorial Church. 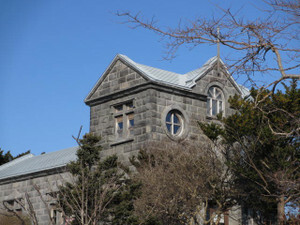 John Batchelor Memorial Church is located on a hill. This area is especially beautiful around June when the hydrangea flowers are in season and the church is surrounded by the flowers in full bloom. Regardless of what time of year you visit, you will always feel relaxed here. 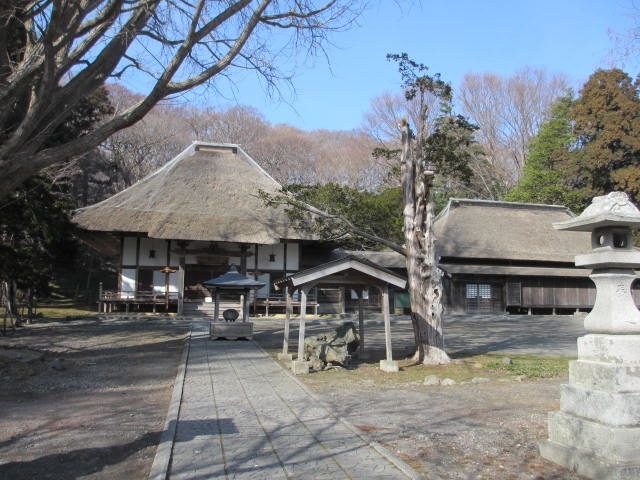 Now we will return to the Ishibashi store on the same path we took to John Batchelor Memorial Church. From there we will go onward to Usu bay and Usu Zenkoji. 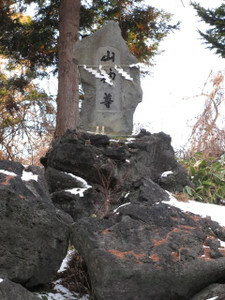 This will take us toward Usu Zenkoji Temple. When you arrive at the fork in the road, go towards the left. 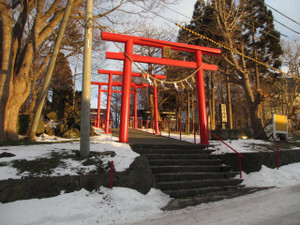 You will see the ocean on your left side, and to your right side you will see the red Torii (arches) of Ousuyama shrine. 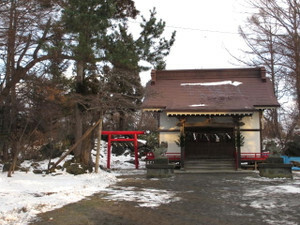 It is a tiny shrine. 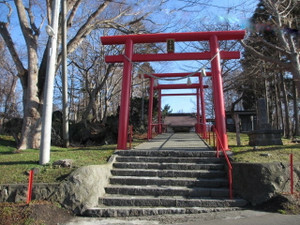 The Ousuyama shrine is known to local residents as “Benten Sama.” It is located by the ocean and is nice and quiet under the clear blue sky. From your left side you can see Usu bay. Soft ocean breezes and warm sunlight will bring you relaxation even in the month of December. As you look around you will see many swans who make their home here. There is a public restroom here. 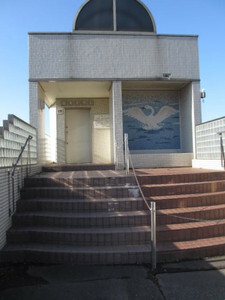 It is rare to see a public restroom in Usu cho. You can use 24 hours. 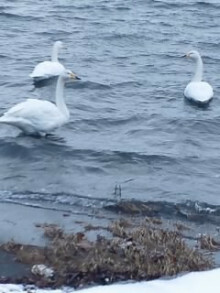 Enmei (long life) Jizouson is next to the community center swan. The gate is open at all times. 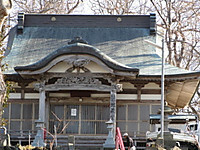 You are permitted to enter the gate even after the temple is closed. 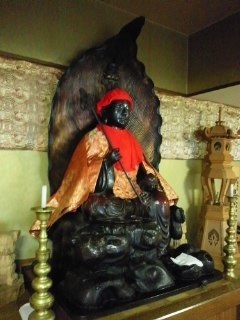 This ojisousama is a protector of the health of family and children. For example, if your mother has knee pain, rub Ojizousama’s knee with a towel and then rub your mother’s knee with the same towel. This is the way to pray to Enmei Jizouson. 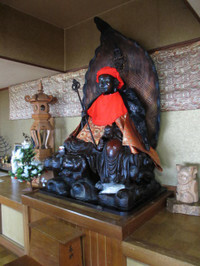 Ojizousama is shiny at the places where people have continually rubbed him for protection and healing over the decades. This place is full of positive energy, love and peace. This short walking trail only takes a total of about eight or nine minutes to complete. We invite you to please come visit this walking trail. It will relax you and fill you with energy.